It's hard to believe we're here enjoying the last day of September. Already. But what a perfect day it's been. The weather is like something straight out of paradise with most every tree, shrub, and flower now brushed from autumn's paintbox. The garden outside my window is alive with bird song and the air is fragrant with that earthy mix of dried leaves and moist soil -- grass seeds are being watered down in a bare patch. The air feels silky against the face while wisps of clouds float along as if they had all the time in the world. Thumbing through my journal, where I write most days, I realized I wanted to gather a few jottings together and offer you a little glimpse of some things I was thinking about -- a few quotes, notes, and gentle reminders that have been a touchstone in some way for me during the month of September. but I am having this one." I've been re-writing this quote in my journal every few days so I don't forget it. Oh my ... this has been such a freeing thought ever since I first read it earlier this month. No matter how settled we think we are in our own skin, I still find times when I'm not. And then, how we can lament those lost opportunities or the forks in the road where we wonder how our lives might have been if we'd only taken the other road. They might not even be about the huge decisions of life, but those smaller ones that we mutter and re-mutter the 'what if' questions to ourselves -- not to mention, to any willing pair of ears, until we all want to #barf. Of course, our lives would have turned out differently, if we'd made different choices and had different opportunities. But we don't know if they would have been better or not. I don't know about you, but I'm totally ready to acknowledge and accept that, and to truly let go and relax into the shoes I call my own. And forget about the what if's already! I'm in the right place at the right time for the life I'm having right now. Good, not so good, and just plain ordinary. So no more letting those nebulous unidentified feelings keeping me wondering. Chances are, as my wise sister is wont to remind the both of us on occasion, in many cases we would still do the same things and make the same choices, given the same circumstances. Yes, there is another life I might have had, but I am having this one. And it is good. Don't you just love that? Jennifer and I worked together a long time ago ... she is one of those beautiful women with a heart of gold, not to mention a ready laugh and sharp wit. She has been as a pen in God's hand on more than one occasion to me with her rare, but all the more treasured, messages of encouragement and grace. They seem to appear out of the blue just when I need them. So, you can well understand why this note was transcribed from my Facebook page into my journal (for safe keeping). fashion beautiful prayers to praise Thee! 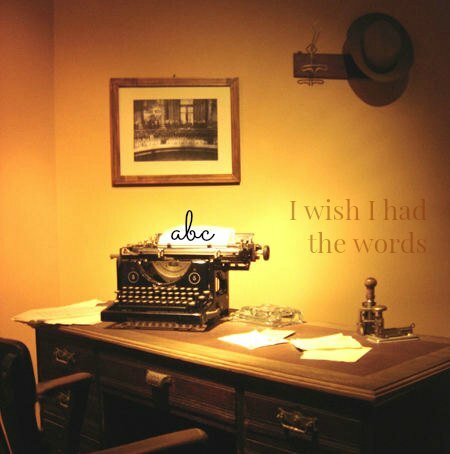 But, alas, I cannot find the words. what I think and how I feel. -- I love drawing swooshy skirts! Must be the 'Queen' on the inside. Love dresses from the 1950s. Maybe there's this urge to sketch such outfits because, as a girl I longed to be grown up so I could wear those feminine, swirly dresses and skirts, but fashion changed before I grew up and I missed out. Always felt cheated with the fashions of the 1960's. and a desire to savor the world." Oh good, I'm not the only one. Haven't quite figured the balance of that but listening to the Still, Small Voice -- those nudges and hunches -- will help us make choices moment by moment. For we need to do and have both the saving and the savoring in our lives. fight back with normal life." Simple things like preparing a a meal, eating it with loved ones, washing up dishes in a sink of sudsy water, bathing the baby, and taking the dog for a walk ... it's what gives stability to our ofttimes shaky world. I want to recommend one of my favourite books to read: the memoir Keeping the Feast by Paula Butturini. It is a perfect read on this very theme -- her story shows so eloquently that daily routines can be comforting and that there is a sustaining power of food and love in the midst of hardship. Yes, yes, that's the secret, Mr. Elliot. Present in the moment. Living it right now and not pining for something else, somewhere else. Wasn't that moon s-p-e-c-t-a-c-u-l-a-r ? Really, there aren't any words for it. Although I didn't get any great shots, I've been privy to some splendorous photography of that moon. So beautiful as to take your breath away. I'm so grateful to everyone who's been sharing online. What a feast for the eyes and soul! 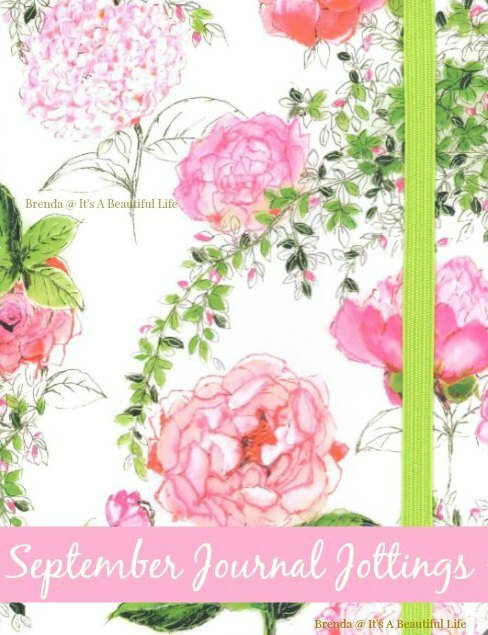 It's a wrap -- it's been a happy September! I'm linking up this week at Little Things Thursday. A great wrap-up to a good month! Thanks for the peak into your journal. Thanks, Sister, you're always an encouragement to me! Appreciate your lovely comment, Laura! BEAUTIFUL post! I love the quote about the life I have now. I am too often wondering, longing, or thinking about what I might have done or should have done or could have done or might be better off doing. Heavens! It's so draining and useless thinking like that! Thank you for this post and for the quote, which I will write over and over until it sinks in. I saw your beautiful art piece using the quote on your FB ... what a lovely way to keep that quote where you can see it often. 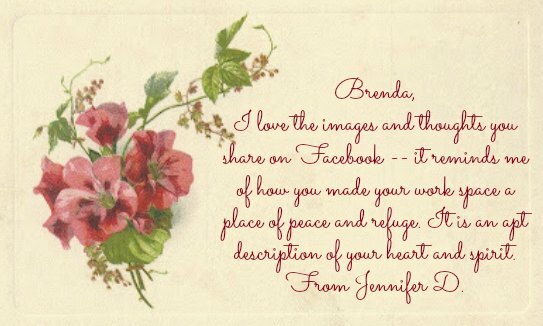 What a great way to reflect on the month, Brenda!! I always find it enlightening to take a look back (thanks for the mention! ), and I am always moved with gratitude! Love the quote by Mr. Elliot. Oh yes, if we would all do just that! Your photo gallery each month is such a wonderful way to gather the moments, as you put it. 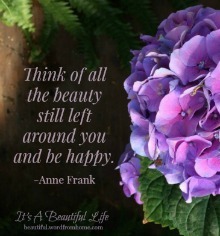 It's a great way to see just how beautiful our lives are and all that we have to enjoy. Puts the 'thorns' in our lives in perspective and makes them feel less intrusive. intrusive when hearts overflow with gratitude instead. What a wonderful post! Loved reading your beautiful insights + musings! And yes, those daily routines ground us! What a joy to 'meet' you, Jandi ... and to find you are all the way from South Africa. I'm so looking forward to getting to know you as we share this blogging journey together. Thanks for your lovely comments. Karen, Always enjoy seeing your comments here. Oh yes, It's A Wonderful Life speaks to me too and reminding me to be grateful for the life I do have, with all its roses and thorns. I wonder too what you might have done if you're life had taken a different path ... are any of those dreams still possible in some form? 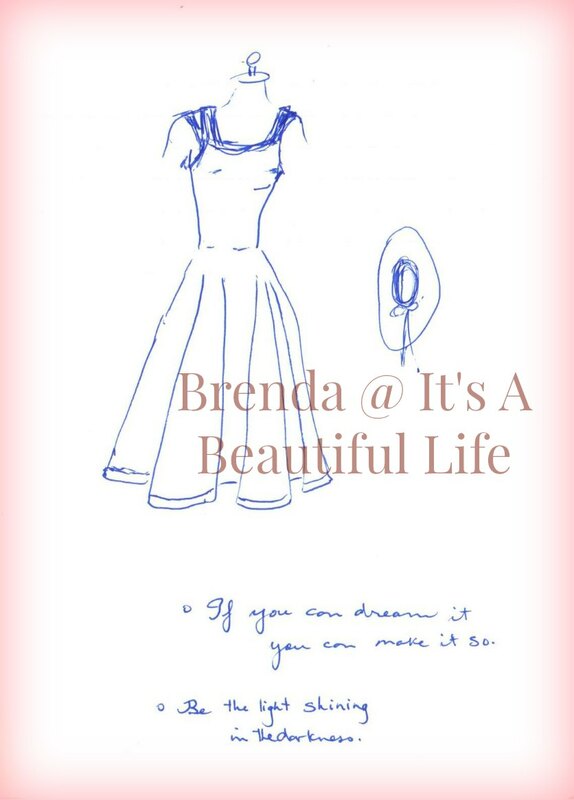 There are moments when we come across of another blogger who touches our hearts and inspires us....Brenda your post, your words did so today for me. I saw your comment on Ann's blog, and thought oh your profile pic looks so much like Cindy from Rosehaven Cottage and you both have the same gentle sensibilities and love of vintage that I had to check you out. We are neighbors, you live in Alberta, I live in BC, in the Okangan...and I happily seem to be familiar with many of the bloggers that visit your blog....how lovely. And I'm always happy to see another Canadian blogger, really there are not enough of us to go around. Jen, I've already been to visit your lovely blog. What lovely compliments you offer me ... I'm touched. 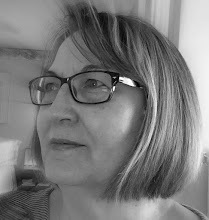 I 'met' Cindy over at Rosehaven Cottage years ago when I first started blogging. She is an inspiration to be sure. I'm glad to meet a fellow Canadian blogger ... let's keep in touch! A simply lovely post today. 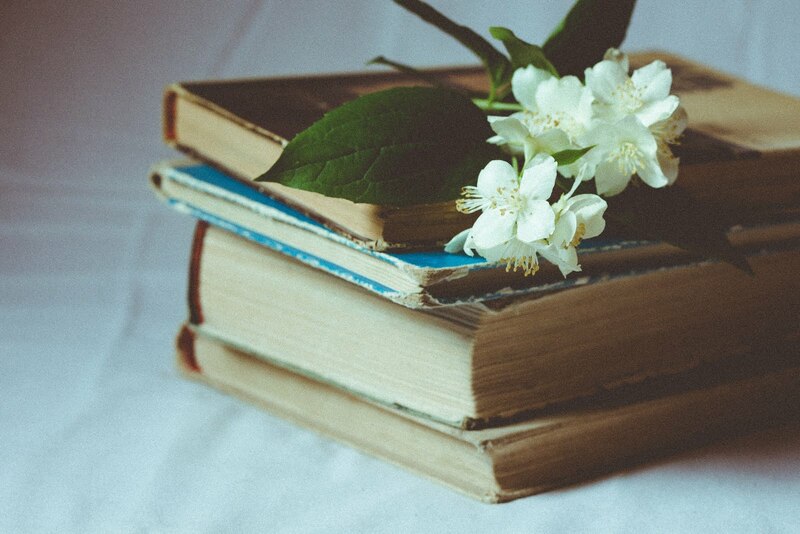 I am new to your blog and every time I read one of your posts I just breathe softly. I have been a follower of Alexandra Stoddard for more years than I can count and also Susan Branch (back when Willard came in my mail box). There is truly something to be said for beauty, calm and serenity. Thank you for being you! Kathryn, how can you know that your own words speak softly into my own heart. But they do! Ah, we must be kindred spirits and I hope we shall enjoy a budding friendship here in blogland. To love Alexandra Stoddard and Susan Branch, well, we're in good company. I'm a more recent follower of Susan Branch, not being really aware of her inspirational work and beautiful life until a couple of years ago. I did have stationery of her once long ago. I'm so glad you stopped by ... wishing you a beautiful day. I'm catching up on posts and it's been delightful to read these two long ones from you this evening. I love the gentle way you savor life and inspire others. Lorrie, your words speak grace to me ... thank you! Hubby and I finished our part-time night job in the Spring, we've holidayed and marked special celebrations all summer long, and now that we're home and working on our new normal for every day living, I'm feeling the creative spark coming back. To write without feeling pressure, to ponder what I might want to share here on blog with my beautiful friends, knowing that I actually have time and energy, that has been a real joy! A good gift that I'm savouring every day. So for good or bad, I'm hoping to be here regularly now ... with real things to share. And to look at writing now as my real job. Wishing you beautiful moments ... you have a gift for finding them, I know! This is so fabulous... the notes, thoughts, great quotes and very nice doodles (I love those swishy skirts too). 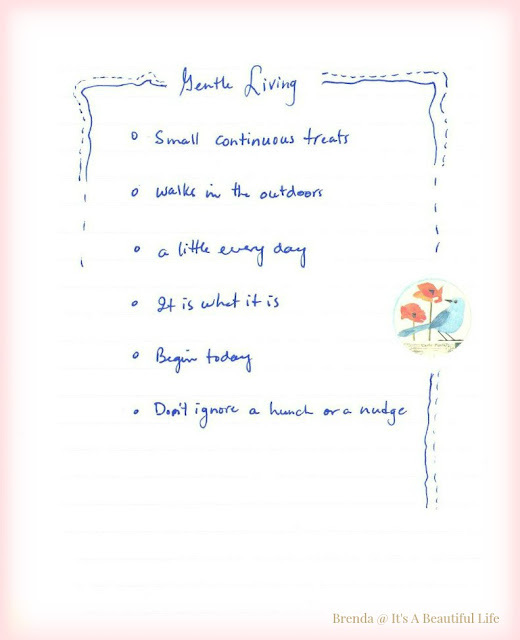 I have always wanted to journal, but never have... but this is exactly how I would want it to be... simply lovely! Oh Bella ... thank you so much. I'm so glad you stopped by. I've been to visit your blog and it's a lovely place to visit!